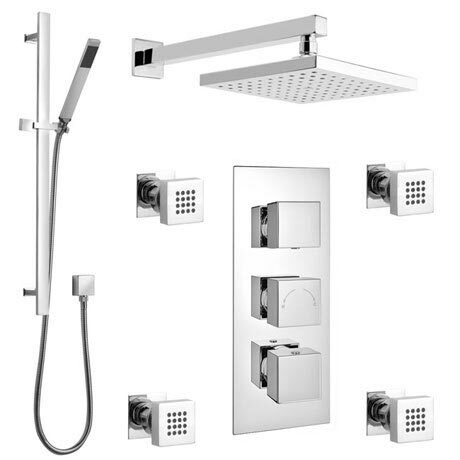 The modern square 3 outlet shower package brings substantial elegance to the modern bathroom. The triple valve enables you to select body jets, fixed shower head or shower handset for a quick freshen up or for a real drenching. Suitable for all types of plumbing installation this shower valve has the added safety benefit of a built in anti scald device should the cold water supply fail. Separate controls for temperature and flow. Operates two shower accessories separately or simultaneously and diverts to a third option: fixed head & slide rail kit, fixed head & body jets or slide rail kit & body jets with option to divert to a third option. At the top end of luxury, the Modern square 3 outlet shower package gives you an invigorating shower without equal. It features everything you would want in a shower and more, with a shower head, handset, 4 body jets and a thermostatic shower valve to suit. This incredible package is perfect for the modern bathroom, looking to add a touch of style and sophistication. The stunning design can complement any contemporary style bathroom and each item has been built to the highest standards of today's manufacturing capabilities. Please note -Certain parts are chrome plated plastic, not metal. Hi, the body jets would be attached to the valve using internal plumbing ie plastic or copper piping which ever your plumber chooses to use. Thanks.